Apna CSC: Common Service Centre (CSC) is a part of National E-Governance Plan Scheme of Indian Government @ www.csc.gov.in. Apna CSC was approved in the year 2006 and works under the administration of the Department of Electronics and Information Technology (DEITY), Ministry of Communication and Information Technology, Government of India. Common Service Centre scheme is working across the various districts of the country. 2.1 Objective of Apna CSC? Common Service Centre Scheme is one of the programs of Government of India under the Digital India Program. It is a wide network that caters to PAN India. CSCs are the service delivery points enabled with Information and Communication Technology (ICT) for the delivery of various public and private services to rural citizens of India. Presently there are total 255798 active CSC Id’s and 687 districts having CSCs across the country. The government services delivered through the network of CSCs include services in the area of education, agriculture, health, FMCG products, utility payments entertainment, banking, financial services etc. To provide access to information to all remote and rural citizens of India. To provide access to quality education and skill development to Indian citizens (majorly rural population). To provide efficient delivery of public services that mainly G2C (Government to Citizen) & B2C (Business to Citizen). To provide cost efficient & quality healthcare services to citizens. To promote rural empowerment, collective action for the empowerment of society and to enable community participation. To deliver Government to Citizen services is the key mandate of CSC. The government keeps launching various services for its citizens through its various Departments and Ministries. CSCs are the entities that serve to deliver these government services to remote areas and rural citizens through their network. Some of the G2C services that are delivered through the network of CSCs are Bharat BillPay, PAN card, Passport, FASTag through CSCs, Pradhan Mantri Awas Yojna (add link), FSSAI, Swatch Bharat Mission, Soil Health Card, Election Commission Services, e-District etc. These are the services which are mainly provided by private businesses to the citizens. CSC helps to deliver these services to rural citizens through Digital Seva Portal. B2C services include Mobile Bill payments, Mobile recharge, BTH recharge etc. The service of financial inclusion is aimed to create awareness among the rural citizens about the digital transactions, digital financial services and to encourage them to make cashless transactions. The major financial services that are delivered through CSCs include VLE Bazaar (a rural e-commerce venture), GST Suvidha Provider, skill development, Banking services, insurance services, Pradhan Mantri Fasal Bima Yojana (PMFBY), Pension service, etc. CSCs also delivers various government services related to agriculture. Through CSC platform, the government also provides various schemes related the education and education, rural students. CSC provides education and certificates courses under digital literacy mission. Some of the education services provided through CSC platform includes NDLM-DISHA, NABARD Financial Literacy Programme, Legal Literacy Programme, Cyber Gram Yojana, Tally Kaushal Praman Patra, GST, and various other programs. Along with educational and agricultural services, CSCs also deliver a number of health serviced to the rural citizens. Some of the health services are Telehealth consultations, Pradhan Mantri Jan Aushadhi and a number of Diagnostics services such as 3Nethra Kits, Hello Health Kits, Thyrocare, JIVA Ayurveda scheme, health home etc. It is the platform of digitizing all the physical records and data and reduce the piles of files and paper in the offices. DigiPay is an aadhaar enabled payment service of Government that is delivered through CSC in rural areas. DigiPay facilitates payment from government schemes such as NREGA, Handicapped, Social Security pension, old age pension of any state or government entity by using an Aadhaar card. It is basically an online electronic signature service. Through this user can digitally sign a file or a document. It is very handy when official and important documents like agreement, contracts are to be sent online. Village Level Entrepreneur (VLE)- At the first level VLE serves people at the local level. VLE serves the rural consumers at the basic level in a cluster of 5-6 villages. Service Centre Agency (SCA)- It is the second level/middle-level entity that serves the consumers indirectly by managing and operating VLEs in one or more districts. One district usually covers 100-200 VLEs. State Designated Agency- At the third level, SDA serves the consumers at the state level by providing requisite, policy, content and support to SCAs. A Building/ Room must be having a space of 100-150 Sq. Ft.
PC (computer) with licensed window 7 or above. Minimum two PC’s with 5hour battery backup or with a portal generator. CSC is a Special Purpose Vehicle (CSC SPV) that connects local and rural people with the Government departments, Private and government institutions such as banks, insurance companies and other service providers/ companies in the private sector by using information and communication technology at citizen service points. How to apply for CSC? Eligible citizens of rural India who want to serve people by being part of this scheme can register online. They can get complete registration procedure here. What is CSC Registration fee? If a person wants to register as a VLE then he/she do not have to pay any registration fee or any other charge. Registration for VLE is completely free. In case user feels any difficulty operating or any other issue related to Common Service Centre , then they must contact the concerned authority and ask for help. 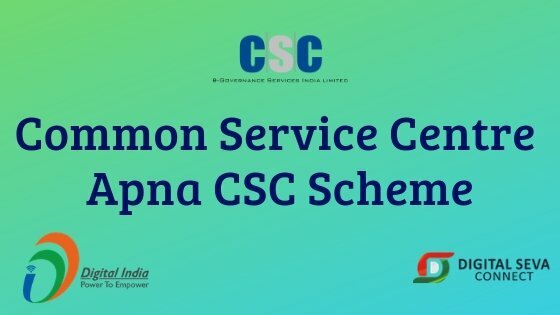 Common Service Centre, apna CSC, digital seva. Our team will help you in solving the problem or query. We have dedicate team which respond to question in fast possible time. Common Service Centre is very good scheme launched by GOI and it is now in phase 2 known as CSC 2.0.
i want csc but page not found. I want to apply for CSC. But application page not found. What can I do. KAYA CENTER KHOLNE SE PEHLE CSC REGISTRAION NAHI KARVA SAKTE. MAIN CSC REGISTRATION KE BAAD CENTER KHOLNA CHAHTA HOON.